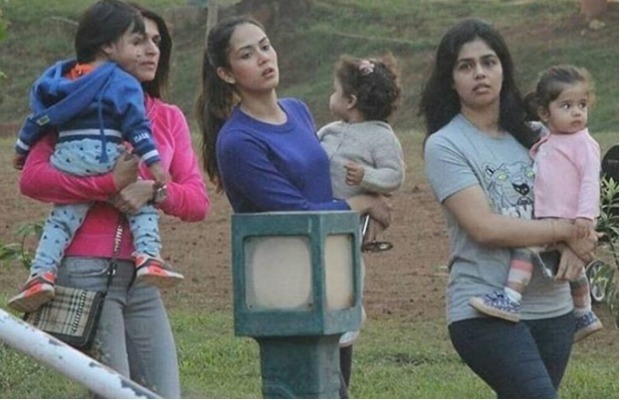 Shahid Kapoor's Wife Mira Rajput Slams Paparazzi For Clicking Daughter Misha's Picture! Home BOLLYWOOD Shahid Kapoor’s Wife Mira Rajput Slams Paparazzi For Clicking Daughter Misha’s Picture! Shahid Kapoor’s Wife Mira Rajput Slams Paparazzi For Clicking Daughter Misha’s Picture! As we all know celebrities are always hounded by the paparazzi. Due to them, even their kids are always in the limelight. Shahid Kapoor’s daughter Misha is one of the adorable star kids and is often spotted with mommy Misha. Recently, Misha was snapped at a garden in Khar, Mumbai with her mother and she was looking too adorable. The paparazzi clicked Misha playing in the garden. The pictures that have been doing rounds on social media see Misha looking cute in a grey sweater and pink pair of pants as she enjoys with other kids. However, Mira didn’t seem to be happy about it. From Kareena Kapoor Khan’s son Taimur Ali Khan to Misha, these star kids are always in the limelight. For the kids who are unaware of their parents’ stardom, it’s not easy to stay away from photographers. @mira.kapoor and adorable daughter #Misha were spotted enjoying an outing at a park in Mumbai. Previous articleBigg Boss 11: In A Shocking Incident, Shilpa Shinde’s Fan Misbehaves And Pulls Hina Khan’s Hair- Watch! Next articleAkshay Kumar’s First Deadly Look From His Next Kesari Is Jaw-Dropping!